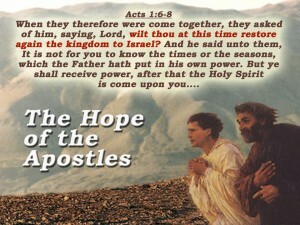 The Apostles’ Doctrine (Acts 2:42) is founded on the Old Testament Scriptures. During the time of the preaching of Christ and later on, the apostles, only the Old Testament was available for reference. Careful reading of the apostles’ teaching, in the Acts of the Apostles and the Epistles, clearly shows that the Old Testament is frequently referred to as the foundation (note Ephesians 2:20 – “prophets”). The Hebrew Old Testament was the first scripture ever translated into another language (Greek) nearly 300 years before Christ was born. This meant it was ready for use outside of Israel in the preaching work of the apostles. God has made three key promises, which are referred to many times in both Old and New Testaments. 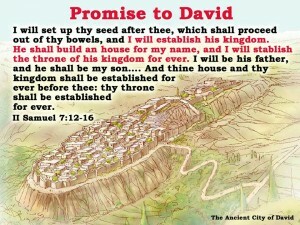 David was promised an eternal place for the people of Israel. He was also promised a throne and an everlasting kingdom. His great son (who would also be the Son of God) would occupy the throne. This is a dominant Bible doctrine, necessary for the fulfilment of the promises to Adam and Eve, to Abraham and to King David. The Church has corrupted this teaching. In the book “Religious Sects” by Bryan Wilson , he writes concerning this: “Until the development of modernist ideas, the second coming of Christ was a belief required of Christians. Until Augustine provided a spiritual interpretation of the church as the kingdom of heaven where the saints would reign, many early Christians expected Christ’s early advent. The Name of Jesus Christ expresses his mission. 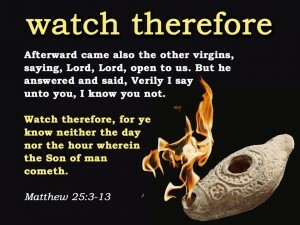 Jesus is the Greek word for the Hebrew “Joshua” – which means “Yah (God) saves”. Christ is the Greek word for the Hebrew “Messiah”, which means anointed or chosen. Hence the son of Mary was chosen by God to achieve the work of salvation – reuniting mankind with their Creator. As Son of God he represented God to man; as Son of man he represented man to God. The problem was that mankind were alienated from God through sin. “All have sinned and come short of the glory of God” (Romans 3:23). For this reason, Jesus was born of a human mother, so that he could deal with the problems to which human nature was prone at their source. He is literally son of man and son of God (Luke 1:35; Romans 1:4). As Son of God, he was strengthened by his Father’s character to triumph over evil. This was a work of God. “God was in Christ reconciling the world unto himself” (2 Corinthians 5:19) God’s dominion had to be re-established in flesh; in Christ first. As a result, his death also testified to God’s supremacy and justice (Romans 3:23-25). Unless Jesus is seen as experiencing the human condition, he cannot possibly represent us, nor die on our behalf. Because he had overcome sin in his life, he was given immortality, and conferred with honour and position, “made both Lord and Christ” (Acts 2:36). 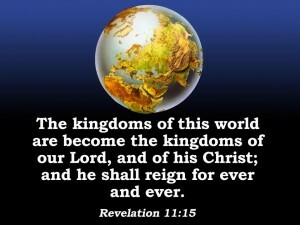 This position qualifies him to be ruler (2 Samuel 23:3; Revelation 3:21), and so he shall be King over all the world. All shall honour him (Revelation 5:9-13). When we look at two of the three great promises, in the context of the preaching of the apostles in Acts, we see that the apostles referred to these promises, as a necessary part of the work of the Lord Jesus Christ. No Bible study, no Bible exposition is effective unless it has the same basis as the apostles used. The promise to Abraham encompasses a land and a people and a international blessing. The promise is confirmed by covenant in Genesis 15 and the borders of land defined. 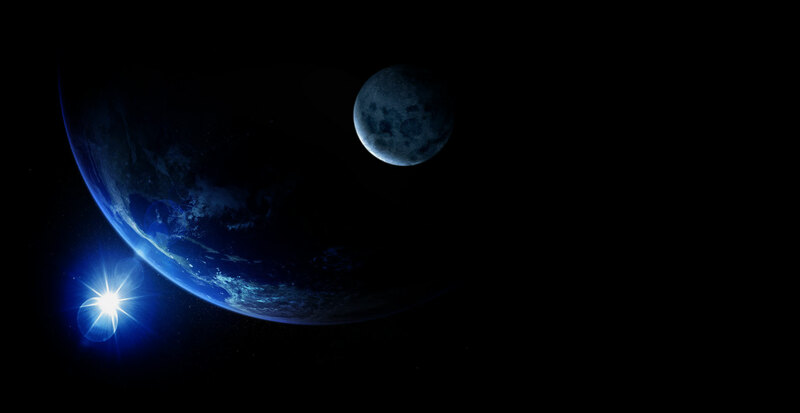 The Oath in Genesis 22 guarantees fulfilment, and incorporates the whole world. 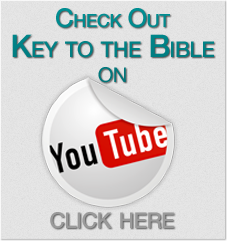 How did the apostles use these Old Testament Promises in their teaching? v13 God, the father of Jesus, is the God of the Jewish fathers. Still titled this, when God was about to bring about the destruction of the nation of Israel. v18 The prophets (in the Old Testament) have detailed the life of Christ in prophecy. Peter and the apostles did not have the New Testament to teach from. They used the OT. v19 Personal repentance is needed, that sins may be “blotted out” There is a time of “refreshing” coming. 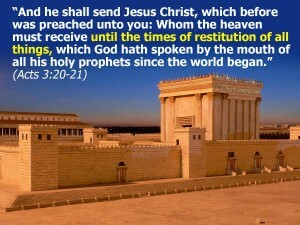 v21 “all things will be restored” – again, all this is in the prophets. The NT does not give full details of this restoration as the OT does. Jesus makes only occasional reference to it, because it was so well known by all in Israel, and by all proselyte Gentiles. Note: Matthew 19:28.
v25 The covenant made with the patriarchs involved a blessing on all the world – this is the great promise to Abraham (Genesis 12:1-3) which is called “the gospel” (Galatians 3:8). For us to be included, involves being adopted into the family of Abraham by baptism into the Lord Jesus Christ (Galatians 3:29). v 26 The sacrifice of Christ, the forgiveness of sins is linked to the promise to Abraham (Galatians 3:14-16). 1,000 years before Christ was born, God promised King David a throne and a kingdom and a dynasty. The words of the angel Gabriel to Mary before the birth of Christ (Luke 1:32,33) are in direct fulfillment of this promise to David (2 Samuel 7:10-16). Peter, in his speech on the day of Pentecost, bases many remarks on the promise to David. Note the nature of his exposition – and his careful explanation of the Scriptures. Look at some of his use of OT references. V34-35 David’s reverence for his own son. Psalm 110. Ultimately, the foes of Christ will be vanquished. Christ will yet act in a political sense to bring the world under control. Next lesson: Organisation of the Believers – we must learn to live as a community with Christ as our head.